From Left to Right in the photo is - Jennifer Ferguson, Event's Coordinator, Michael Robinson, Senior Vice President, David Babington, Chief Executive of Action Mental Health, Alan Hunter, Chief Executive of the Law Society and Callum Clark from AMH. 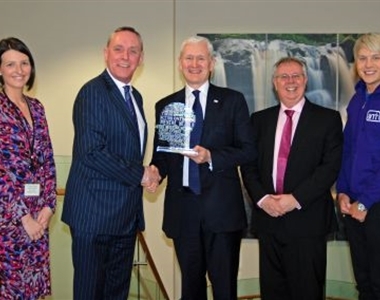 The Law Society has been presented with an award from Action Mental Health for its partnership and sponsorship undertaking in 2013 in support of the local charity. In total the Society was donated £15,000 towards AMH. 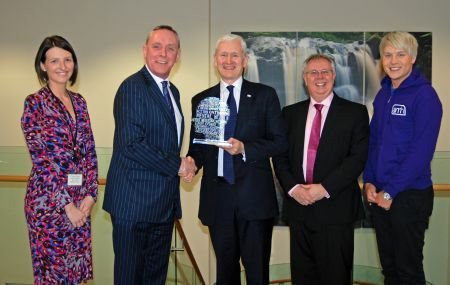 David Babington, Chief Executive made the presentation of the award to the Society’s Senior Vice President, Michael Robinson and Chief Executive, Alan Hunter at the ceremony at Law Society House. Also in attendance was Jennifer Ferguson from the Society and Calum Clark from AMH.